Manchester United will bring down the curtain on 2017 with a game against Southampton at Old Trafford and need to end the year on a high. A miserable six days comprising of a defeat to Bristol City alongside agonising draws with Leicester City and Burnley have put a dampener on what has been, on balance, a decent 12 months. And Jose Mourinho will want to remind supporters of that notion by seeing his front four assert themselves from the start against Mauricio Pellegrino’s men. 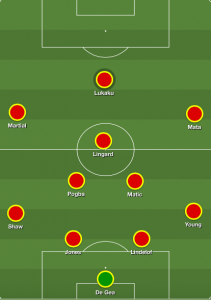 With that in mind, here is a potential XI featuring Anthony Martial and Jesse Lingard. The likes of Zlatan Ibrahimovic, Henrikh Mkhitaryan and Marcus Rashford have not impressed with their performances in recent weeks and Mourinho has to be ruthless and leave them out completely, possibly drafting in Callum Gribbin as an alternative option off the bench. And he will be counting on Lingard and Martial, as well as Juan Mata, to set an attacking example. The former saved Man United in the second half against Burnley by merely being direct and purposeful on the ball, while Mata provided a touch of class at the Kingpower Stadium that was in short supply elsewhere. Combined with the raw threat of Martial, supporters will hope to see their side enter 2018 in the right way.